The days are getting shorter. The air is colder. And, roads are often slick with rain, snow or ice. It’s winter driving season in St. Louis, Already! 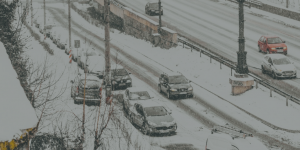 And, while most people know what to do to try to avoid an accident, many don’t know what to do after a winter car accident. It’s vital knowledge to have, because the aftermath of a crash can be just as dangerous as the crash itself — especially when it’s cold and snowy. Make sure everyone’s OK — then get off the road if you can. The safety of everyone involved in a crash is the first concern, of course. So, check on the occupants of each vehicle and call for emergency assistance if it’s needed. Then, if the vehicles are drive-able, get them off the road as soon – and as carefully – as possible. Stay visible — and warm. Turn on your hazard lights and put up road flares so other vehicles know something is wrong. And, grab your vehicle emergency kit (you have one, right?) for blankets and extra clothing. If you’ve run off the road and you’re still in your car, make sure nothing is blocking your exhaust pipe. Otherwise carbon monoxide may build up. If you’re stranded, stay put. Running off the road in a remote area is scary, but resist the urge to try to walk for help. You risk getting lost, especially during a storm, if you set off on foot. See a crash? Don’t always stop to help. Being a Good Samaritan could cause more problems than it solves. So, if those involved aren’t in immediate danger, call 911 and let the professionals help with medical aid and traffic control. And, remember, if something does happen on the road this winter, HALO Insurance & Benefits Group is here to help with your auto accident claim. If you’re unsure whether you’re carrying the right coverage, call now before it’s too late!